In 2018, we put the pedal to the metal, attending or speaking at a number of important conferences, leading a STC training and participating at a summit focused on respite for caregivers. All of these events recognized what we have been broadcasting for years, the coming 2030 aging crisis–a time when there will not be enough health professionals or people to take on the care of 71 million boomers over 65, many of whom will need support. During the year, we identified an immediate phenomenon where STC can provide help: during the patient’s transition from hospital to home. Here the care team, and not just the family caregiver, can be instructed on how to care for the loved one to avoid hospital re-admission, an all too common occurrence in the face of caregiver stress, burnout or social isolation due to lack of support. Many hospitals have “People”- Centered Care Programs, a natural fit for STC to be introduced at discharge, or during hospital support groups after receiving a difficult diagnosis. We will add this focus to our work in the coming year as we continue to introduce STC to the friends, neighbors, and faith communities where many seek help, assist working caregivers who find themselves overwhelmed as they juggle their caregiving duties with their jobs and family responsibilities, strive to incorporate STC into the curriculum for social work and nursing, and work to offer a Spanish edition of STC. Your Support Has Never Been More Critical. We have our work cut out for the coming year and far beyond. To accomplish any of this and ultimately make “Let’s Start an STC Group” the household refrain when faced with a family caregiving medical or aging crisis, please donate to ShareTheCaregiving with a meaningful tax-deductible donation of $100, $500 or $1,000 now. Perhaps you’ve just become a family caregiver or were helped by an STC group, regardless, please reflect on the value of having a ready-made plan to organize and sustain a group to help you care for your loved one. Click here to read our above accomplishments as an enlarged and printable PDF! 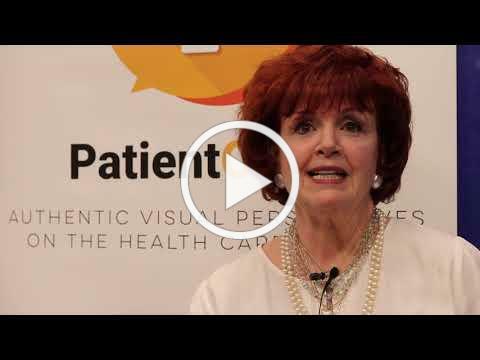 We want to share two videos that Phyllis Quinlan, PhD, RN-BC and I (Sheila) did recently at the Planetree Conference in Boston, thanks to Kistein Monkhouse, MPA – PatientOrator. What makes them special is that we cover the Share The Care model from different perspectives: the layperson who lived and helped create it and the professional who understands its true value for hospital person-centered care programs. Clicking on the above video links will take you to the STC YouTube Channel to view them. A heartfelt thank you to all of our supporters! We envision the STC model being integrated into person-centered care programs in hospitals around the country and woven into of the curriculum for students of social work and nursing. 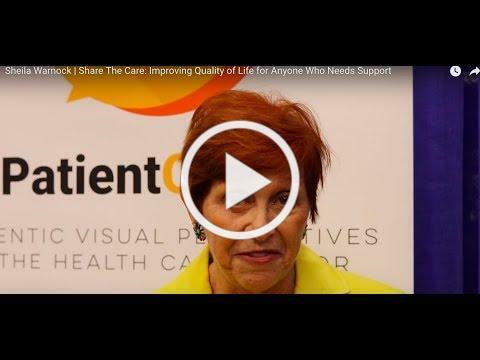 To make these goals a reality we need to step up the level of STC awareness among caregivers, professionals and institutions to confirm what this RN had to say about STC. “Such a wonderful experience in caring for our fellow human beings. In order to accomplish all of this we need your support to cover the cost of conference/travel expenses to attend, present and network at the targeted conferences below. Please realize that opportunities to present at Planetree and NHCGNE are limited and very competitive and being selected as a presenter is a VERY big deal! We have raised 25% of the needed $6,000 to cover the costs of conference fees and travel expenses. PLEASE HELP US RAISE THE REST TODAY. Your gift of $25, 50, $100 or $500 or more can take us there to do our work and get people talking about STC. Please include your name and address so we can properly acknowledge your gift and; if you would like to be kept informed of STC news, your email address. THANK YOU!!! We will keep you posted on these conferences in our upcoming STC Newsletters. We have several great opportunities during the rest of this year to spread the word about our evidence-informed STC model and to network with brand new audiences. My attendance at the important conferences listed below would allow me to make valuable connections that could lead to significant visibility and progress for STC and our organization. However, we do need your support to enable us to attend. to cover travel, hotel and conference fees. We ask that you TAKE ACTION NOW as our first conference is in June. A generous tax-deductible donation of $100, $500 or $1,000 or more would help us. Or pool your donation with others in your group for one larger one. To donate online go to: www.sharethecare.org and click on any SUPPORT US button. The goal is to collaborate and ensure the volunteer sector continues to grow and innovate in this rapidly changing world. As the world’s largest service-related convening, it brings together more than 2,500 nonprofit, government, business and civic leaders to gain and share the knowledge, resources and connections needed to galvanize the power of people to create change globally. L’Oreal Paris Women of Worth has provided me with a scholarship to cover the conference fee. Planetree is a non-profit organization that provides education and information in a collaborative community of healthcare organizations, facilitating efforts to create patient-centered care in healing environments. We have just received notice that we are 1 of 15 selected to present! This is huge!! A three-day event for caregivers sponsored by CareGiving.com. It will include a 2018 VISIONARY AWARD reception for five winners and if you recall, I am one of them. We will also participate in panels during the conference and I will have plenty of network time to meet caregivers and introduce them to STC. Because I am a Visionary Award Winner my conference fee has been waived by CareGiving.com. A one and one-half day event for gerontological nursing leaders. One of the objectives of this conference is to broaden the discourse on aging, diversity and formal and informal caregiving for persons with dementia and other disabling conditions related to aging. I am fortunate to have received an invitation to introduce STC and have a discussion about our caregiving formula at a lunchtime table discussion. Recently at an event, a working caregiver stopped by our STC table. Intuitively, I sensed that this particular woman was truly in desperate need of help. At first she was reluctant to engage in much conversation and was readying herself to walk away. So I took a chance and looked into her eyes and asked “can I give you a hug?” It was that hug that blew open the dam. “I’m so overwhelmed. I’ve been taking care of both my mother and my father for over 15 years. My sister is of no help.” It was also clear that a lot of time had gone by since anyone had asked her how she was doing or took the time to listen to the enormous responsibilities she was carrying. This tiny demonstration of concern cracked open a door to a discussion with her about self-care, asking for help and how STC works. Every day the number of caregivers is increasing and they NEED to know about STC. Our grassroots, evidence-informed model continues to prove its effectiveness as a compassionate solution to help caregivers everywhere. It is one of the most rewarding solutions to the caregiving crisis especially since STC gives novice caregivers a way to learn how to be a caregiver in the company of others, many of whom may be veteran caregivers. We Need Your Support. There are important conferences we need to attend, STC materials to be developed and printed and STC books purchased to send to individuals and organizations that can raise the visibility of our cause. Funds can help us enlist the services needed to do a webinar, for tech support, and to work on developing collaborations. It is also critical to have funds available when opportunities strike. We have requests for a Spanish and French edition of STC and are seeking publishers in other countries. Do you know any? If you have never made a donation to ShareTheCaregiving, Inc. before, please make this the year you start. If you are part of an STC group, or are helped by one, please reflect on your experience and the value of having a ready-made plan to organize and sustain your group. We need you to TAKE ACTION NOW to back our work generously this year. A meaningful tax-deductible donation of $100, $500 or $1,000 or more would help sustain our efforts. Click here to read our above accomplishments as an enlargeable PDF! You are the BEST! We are always encouraged by the enthusiasm that groups, health professionals, faith communities, working caregivers and our friends have for the STC model. It is the fuel that keeps us going. 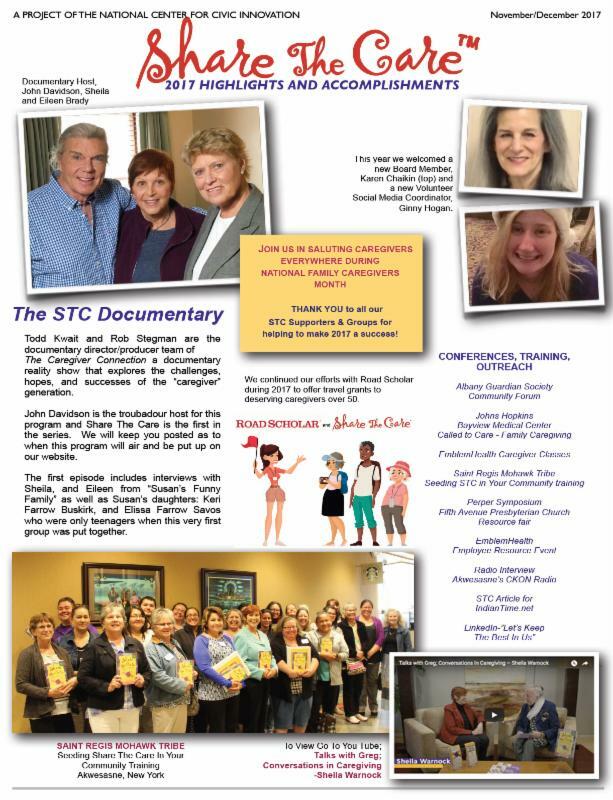 Last year your donations made it possible for us to present STC and the research at several highly visible global conferences in order to build awareness that STC is an evidence-informed caregiving model. We were very successful in establishing important new contacts and interest for STC. Thank you! At the top of our wish list for this year are funds to purchase (newer) refurbished computers and tech person to install software and transfer all our files. Our equipment is totally outdated. Our computer operating systems are no longer supported by FireFox or Safari so that drastically limits our ability to participate in certain webinars or download files. We are also in great need of a lighter, and more up-to-date laptop for travel/teaching. COLLABORATIONS are key to expansion in 2017 and we are delighted to report on one already in action. STC and Road Scholar have joined forces to give family caregivers and individuals in STC groups an opportunity to apply for ten educational travel grants. STC is reaching out to our STC groups and to other organizations in order to alert their caregivers about this chance for a well-deserved respite experience. If you qualify to apply, or in the case of STC groups, you have a deserving member you’d like to nominate, check out the special landing page we have created for this exciting promotion. Visit our website DONATE page that lists a variety of other ways people can give including shopping online through our website. And please send us your STC group photos and stories to inspire new groups. Your tax-deductible donations will cover our conference fund allowing us to travel and present the STC model and research at highly visible conferences. (Our abstract has already been accepted by four.) Also to cover the cost of books, printing brochures and creating new program materials. My computer is over 12 years old and needs to be replaced. Click here or on the image above to read our accomplishments as an enlargeable PDF! Whether you are a caregiver, a group member, a health professional or a community please consider the ways STC has impacted your life, your work and your community for the better and take action to support our mission. With only 3 days left before the New Year please consider a tax-deductible donation to STC especially if you have never gifted us before. Help get STC off to a rousing start in 2016 and build on the considerable momentum gained in 2015. As our work continues to touch the lives of so many around the world, we ask for your support now. Please consider a tax-deductible donation of $100, $500 or $1,000 (or whatever you can afford) to help us to expand and sustain our efforts. Please give generously online at: www.sharethecare.orgor if you prefer to give by check please make it payable as listed below and mail it to the address shown. You can even make a significant donation to STC as a whole group. Please visit our website DONATE page that lists a variety of ways people can give.And now you can support us by doing your online Holiday (or anytime) shopping or travel reservations through our website. With gratitude, and best wishes for a Healthy, Happy New Year. Your tax-deductible donations will cover our conference fund allowing us to travel and present the STC model and research at highly visible conferences. Also to cover the cost of books, printing brochures and creating new program materials. My computer is over 12 years old and needs to be replaced. HAS BEEN WORKING FOR 20 YEARS!!! OVER THE YEARS YOUR SUPPORT has allowed us to evolve from a guidebook to a non-profit organization that continues to help care recipients, their caregivers and families at a vulnerable time by providing a tried and true plan for their relatives, friends and neighbors to help them. In fact, the recent STC research that included participants from the US, Canada and Australia confirm the benefits to everyone involved in a STC group. As we end 2015, STC is being used for a new State Initiative in Wisconsin that will focus on supporting people who live alone with early stage Alzheimer’s Disease. Our next professional training is scheduled for December at North Shore-LIJ Stern Center for Rehabilitation in Manhasset, New York. We alsolearned that at the NYS Caregiving Respite Conference in Albany this month, the STC presentation rated “highest in relevance” for the 118 participants – caregivers and health professionals from throughout New York State. We are optimistic about 2016, especially since we have recently welcomed three new Board members. Our goal now is to step back and take an objective look at all we’ve accomplished and with the help of our Board, Steering Committee, Advisory Board, donors, caregivers, STC groups and volunteers chart a roadmap for the coming years. As the STC model continues to touch the lives of so many around the world, we ask you to take action now. Please consider a tax-deductible donation of$100, $500 or $1,000 to help us grow and expand our efforts. Please give generously online at: www.sharethecare.org or if you prefer to give by check please make it payable as listed below and mail it to the address shown. The Baraboo, WI STC Training to kick-off a new state-wide initiative using STC to support people living alone with early stage Alzheimer’s Disease or dementia. for her vision, leadership and dedication to help caregivers. A HUGE THANK YOU to all of the STC care recipients, caregivers and group members from the US, Canada and Australia who participated in this important study. It could not have happened without you! And we truly appreciate all the groups out there using STC to help more and more people who need caregiving support. BRAVO. Unless you are in the healthcare field this study may not seem like a big deal, but for STC, it should help to open more opportunities for funding and programs so that we can reach, teach and help many more caregivers everywhere. Our job now is to get the word out to professionals. Researcher, Amy Hegener and I need to present “SHARE THE CARE™ – An Established Model Supported by Research and Practice”at important conferences in late 2015 – into 2016 and have submitted abstracts. NOW, AFTER A YEAR OF HARD WORK to reach this point, we really need everyone’s support to cover our conference fees and travel. Please donate online at www.sharethecare.org or if you prefer by check. Your can make a donation in honor of a friend or loved one. If you are in a STC group this is a great reason for a group donation. YOUR GIFTS ARE TAX DEDUCTIBLE. 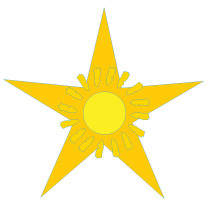 Please include your name and address so we can properly acknowledge your gift and; if you would like to be kept informed of STC news, your email address. As always your group stories and photos for our website are always encouraged and welcome. The STC program is supported by a descriptive evaluation using a non-experimental mixed-methods design. The study sample was purposive and included a total of 143 participants from around the US, Canada and Australia. Data were collected via an online survey and through follow-up phone interviews. Is participation in STC associated with a reduced level of burden for the primary caregiver and/or other family members? Is there an association between participation in STC and improved confidence in caregiving skills among group members? Is there a relationship between the shared experience and group members’ satisfaction? demonstrating variability that can be applied across settings and cultures. These findings provide a foundation of supportive evidence that confirms STC as a best-practice model in the field of caregiving and one that can be replicated in a cost-effective manner across locations and challenges. The results of this study further indicate that STC is effective in addressing a number of different challenges, whether short or long in duration. It was the most rewarding experience of my life. It proved that I could contribute so much without feeling overwhelmed or overburdened. It taught me to trust others, to know the real meaning of “team work”. A few days ago I received an email from the sister of a woman whose caregiving story was recently profiled inPsychology Today‘s blog, The Dance of Connection. A link to that story is provided below, but I wanted to share a portion of the message I received as a reminder of the impact STC has on people’s lives. A long-awaited evaluation of the STC model is underway by a researcher from the State University at Albany. The study is intended to establish an evidence-base that will support the continued growth of the STC™ program to help many more caregivers. We are in the final stages of building a new home website that will address the specific needs of our varied users: caregivers & concerned friends, health professionals, faith communities, and corporations and working caregivers. We plan to highlight examples of successful STC™ programs that blossomed following our STC Trainings. We are proud to say that as a volunteer-driven organization, we have been able to direct almost all of the funds raised directly to benefit caregivers who turn to us for help. We make every effort to take the time to make a personal connection with people who contact us and/or are willing to share their stories. All STC™ services and materials – other than trainings and workshops provided to organizations – are provided without charge. WE REALLY NEED YOUR SUPPORT TO KEEP THE MOMENTUM GOING. Click here to donate online or if you prefer by check. We also invite you to donate in honor of a friend or loved one. Of course, YOUR GIFTS ARE TAX DEDUCTIBLE. Please include your name and address so we can properly acknowledge your gift and, if you would like to be kept informed of STC news, your email address. As always your stories and photos for our website are always encouraged and welcome. With gratitude from all of us at ShareTheCaregiving.